Unless there's a clever marketing day today in which content is right aligned in order to highlight some cause - it looks like Facebook has a rather odd (in a funny way) problem with their Open Graph widgets. Content in the "Recommendations" widget is backwards; the icon apepars on the left, full stops appear on the right. Content is backwards. 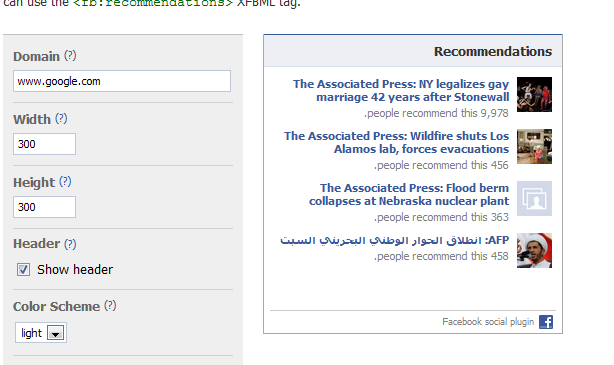 You can play around with the widget on this dev page and even see what Facebook would recommend for you or your site. The example in my graphic below is for www.google.com and rather shows a problem with the concept. 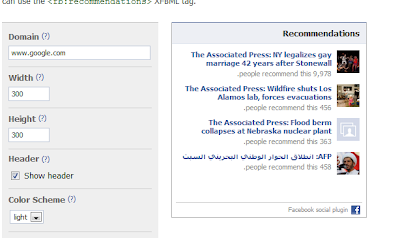 In this case Facebook isn't just showing the content backwards but is recommending Google's hosted AP news stories. They're interesting but they're hardly key to the over all Google.com experience. Can you re-create the bug?